Gallery 38 is pleased to invite you to the second solo exhibition of new work by Norman “Nomzee” Maxwell. Maxwell is an American Contemporary Artist based in Los Angeles. 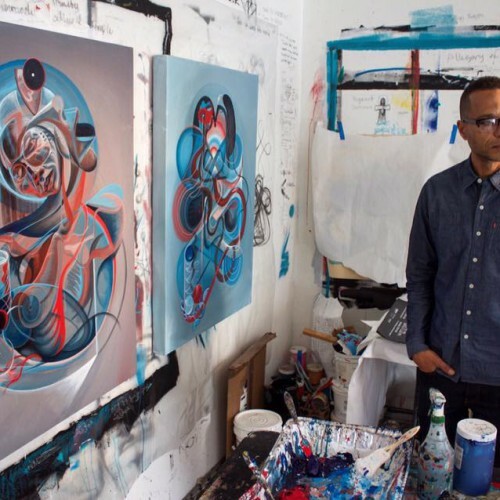 Maxwell’s signature style references a broad range of emotions, symbols and ancient traditions which manifest through a stream of the subconscious, creating a rich and diverse visual language that is uniquely his own. Maxwell attended the Hussian School of Art, where he studied illustration. He spent weekends exploring galleries of the at the Philadelphia Museum of Art, where he became intrigued with the Baroque paintings of the Renaissance Wing. Infatuated with the Surrealist movement and it’s profound mystique, he was particularly drawn to their emphasis on liberating the subconscious mind. His most prominent influence was his painting instructor, Symbolist Painter, Virgil Sova, who introduced him to many seminal works such as ” Man and his Symbols” by Carl Jung and Joseph Campbell’s “The Power of Myth”. In 2007, Norm opened the “Norm Maxwell Studio Gallery”. The gallery provided creative and exhibition space for collaborative projects with local and international artist. Hosting exhibitions featuring artists from Beijing, Addis Abba, Seoul, Korea and Havana, Cuba and the annual “Colors for Unity” exhibition in partnership with Inner City Educational Foundation since 2008. In 2009 NMSG founded the Fairfax Artwalk in an effort to build community through art. Norm Maxwell Studio Gallery became an international destination synonymous with the emerging creative culture of the Fairfax District. Norm was also a featured Exhibitor of the Berliner Liste Art Fair in Berlin, Germany, 2011 allowing Maxwell to procure collectors around the globe. “Voyage Through The Void”, his latest work is a departure from the social issue and subject matter of the material world. His last exhibit with the gallery, Channel 7: A Composition in G Major”, opened successfully with museum curators and collectors alike in attendance.He has sought refuge among the chaos, immersing himself into a whole-hearted reconstruction of mind, body and spirit in the esoteric realm. Traditionally, Maxwell has used a wide range of color in his work to create a palette with vast opportunity. In this series, he uses two colors from opposite ends of the spectrum, with the intention of using color to express duality. Maxwell’s paintings and urban art are recognizably rich and so unique that art connoisseurs around the globe seek his work. A perfect example is the serendipitous bond established between he and Jun Moon of Seoul, Korea. In June 2015, Maxwell was able to extend his artistic reach; arching over land and sea like a meteor and presenting the Norm Maxwell gallery to Seoul. The exhibit will be on view to the public, April 16th through May 15th. Gallery 38 is located at 5376 W. Adams Blvd, Los Angeles CA, 90016. Gallery Hours: Wednesday – Sunday 1- 6pm. 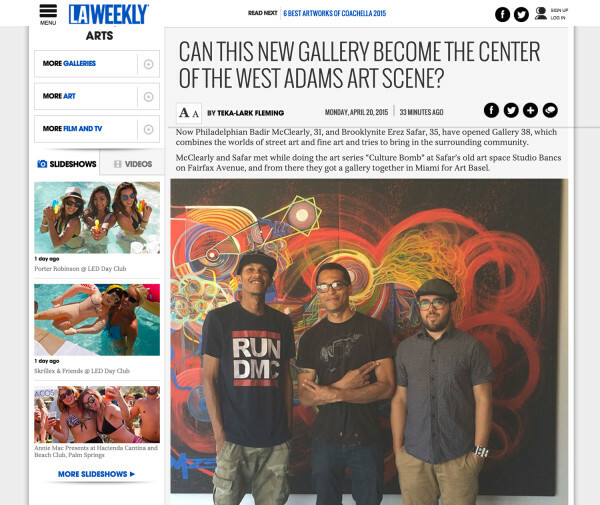 Gallery 38 opened it’s doors in March of 2015 with the hopes of starting a artistic renaissance in the West Adams neighborhood. One year later, the mission continues. Located on Adams Blvd, just west of La Brea Ave, Gallery 38 has lent its artistic influence to the community through murals, art talks and culture mixed with entertainment to a neighborhood void of it.